In this gripping novel of romance and social consciousness, a white California teenager encounters the effects of racial prejudice in the segregated South of the 1950s. In 1986 Los Angeles, Hannah Ross is devastated by the death of her father, but her world is turned upside down when her mother, Catherine, decides to share some long-buried family history. 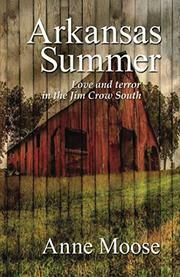 Most of the novel that follows takes place in the summer of 1955, as Catherine, a teenage college student, accompanies her father, Ben, to his childhood home in Arkansas to help her recently widowed grandmother, Mama Rae. Ben hasn’t visited the South in more than a decade, largely due to a desire to protect his children from their grandfather’s racist attitudes. The casual cruelty of whites in the Jim Crow South comes as a shock to Catherine, and she soon draws attention for her refusal to participate in it. She also finds herself irresistibly drawn to Jimmy Emerson, the college-aged African-American son of her grandmother’s housekeeper, Sally; he’d been her playmate during past childhood visits to her grandparents’ farm. Despite Ben’s, Mama Rae’s, and Sally’s warnings, they pursue their youthful attraction, and the life-shattering consequences will have repercussions for generations. Moose (Berkeley U.S.A., 1981, etc.) is a compelling storyteller, and this one unfolds with page-turning urgency as she paints a convincingly chilling portrait of white supremacy in a small Southern town. However, some of the characters here seem a bit too good to be true, while others are mere caricatures of evil, so readers looking for a more nuanced cultural study may be disappointed. Even so, readers will genuinely care about Catherine, Jimmy, and their families; the transformation of Mama Rae after her husband’s death is a delight, and the ending is satisfying without tying up its loose ends too neatly. A thoughtful “Author’s Note” with suggested reading about the Jim Crow South follows the text. An often powerful novel about courage and integrity in the face of hate.